Download our FREE Proposal Specialist Guideand study at your own pace. 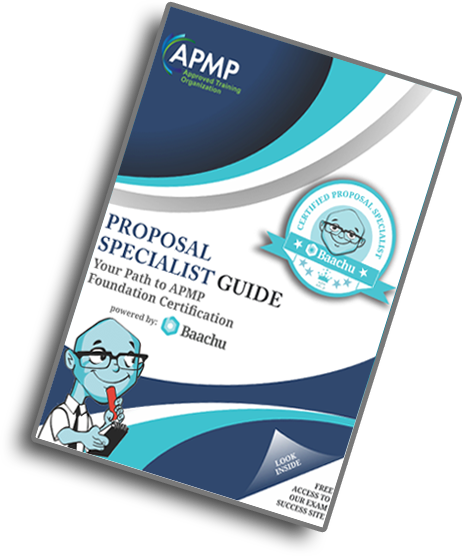 The Proposal Specialist Guide consists of chapter-wise breakdown of core units covering the very important and highly important topics based on APMP’s Foundation Level Certification exam syllabus. Enroll for Baachu’s APMP Foundation Level Online Training Course and get access to chapter-wise video lectures, downloadable lessons & Cheatsheets for every chapter, Mock Tests, Practice Exam PLUS FREE membership to Baachu’s APMP Facebook Study group. Register for Baachu’s APMP Foundation Comprehensive Webinar and attend a 3.5 hour webinar covering the extremely important and highly important sections from an examination point of view. Bidding professionals from INDIA can register for Baachu’s APMP 500 Challenge. By putting yourself up for this challenge, you are committing to complete the APMP Foundation Level in 30 days.